Two players with one ball, 3-minute shooting, shoot for 30 seconds each from three spots - short corner (1 point), elbow (2 points), and top of the key (3 points), partner rebounds, change the shooter every 30 seconds, and spots after 60 seconds. The world record is 97 points (combined score). With younger players, shoot from the block, mid-post, and foul line. coachesclipboard.ca - with children, use three cones in a diagonal line one, two and three steps from the backboard, each player takes one shot from each spot, only bank shots count, maximum score is 6 points, repeat. 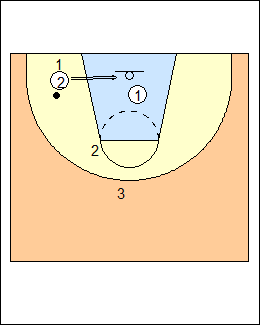 Use both sides with four players at each basket. Barry Adams - Make 'em and step back -two teams, make 4 shots 3 feet from the basket, 3 shots from 6 feet, 2 shots from 9 feet, and 1 one from 12 feet. Variations - make 5 from each spot; only swishes count.